John Steptoe’s and Coretta Scott King’s…oh my. In a blink of an eye publishing time (so more like a slow droop) Sundee Frazier went from debut author to award-winning author. It’s the honor of an elite few, but the dream of many. With Brendan Buckley’s Universe and Everything in it snug on shelves with its new shiny Steptoe Award Winner sticker, I caught up with Sundee during a most perfect time – that window between the wonder of it all and the reality. BBS: How did you find out you’d won the John Steptoe award? Describe the moment. What were you doing? He said that Vermont College (he was the faculty chair there when I earned my MFA) was very proud but didn’t tell me for what. The second email I opened was from my agent, Regina Brooks. She had heard through the grapevine I’d won the award, but needed to confirm. After my husband got on the Internet and found the ALA press release, I realized I should probably check my voicemail. Sure enough, there were messages from the Coretta Scott King committee chair and my editor, and I knew it had really happened. I was ecstatic. BBS: How has the landscape changed for the book? Has there been a jump in orders from stores/libraries or sales? Are you seeing or hearing about it being in bookstores, across the nation, that it wasn’t before? Sundee: Well, the day of the announcement my book’s Amazon.com ranking rocketed from around 700,000 to 4,500! So that says something. It has continued to do well on various sub-category lists on Amazon. And my publisher immediately ordered a second printing of the book, so there are double the copies out there now. My husband was in Milwaukee for business in early February and found three copies at Barnes & Noble (as far as I know, the chain didn’t originally pick up my book on any widespread basis) – and they already had the medallions on the covers! That was exciting to hear. So, yes, I’d say the exposure was very helpful for getting the book into more libraries and stores. BBS: Brendan Buckley tells the tale of a bi-racial boy. You’re filling two literary voids with one story. Why this story? Why now? Sundee: As for why now, some people may think I strategically picked this topic because of the rising numbers of biracial children or the increasing interest in the biracial experience or even the dialogue around a certain presidential candidate’s ethnic identity. In truth, I had no idea what this story would turn out to be when I started. I knew the main character was biracial, with a black dad and a white mom, but the character actually started as a girl. Yes, Brendan Buckley was originally Brenda Buckley! I changed the character to a boy, again, not out of some strategic marketing choice, but because I woke up one morning and realized the character was supposed to be a boy. The change actually helped free up my imagination – I was able to let Brendan be who he was instead of continually seeing myself as a kid as I wrote. As it was, I grew up knowing both sides of my family and had close relationships with all of my grandparents, but I thought it would be interesting to explore a family that has splintered because of a white parent’s inability to accept his daughter’s choice and the effect of that on the grandchild. Unfortunately, families are still torn apart to this day over this kind of racial and ethnic intolerance and rejection. BBS: Writers like to playfully debate, if given a choice, whether they’d choose critical or commercial success? Assuming your Steptoe award leads to greater commercial success, what would your answer have been prior to the win? And what’s your feeling on the topic now that you’re in the midst of it? Has it impacted your writing process or writing at all? Sundee: I have always been more interested in critical success, but if I’m honest, I figured if I achieved critical success, my books would sell well, too! My feeling on the topic now (as well as before the award) is that I always want to write the best story I can. “Best” to me means moving readers, broadening their understanding of themselves and others, and most of all, helping kids know they’re not alone in the things they think and feel. BBS: I’ve often said that I’ve felt “invisible” because there were so few books that portrayed my own teen upbringing and my daughter’s (suburban, middle class African Americans). Talk a bit about that “invisible” feeling as it relates to literature and being bi-racial. Sundee: I’m so glad you’ve brought this up. People tend to think of racial groups (racial minority groups, in particular) as being monolithic, when in fact there is a wealth of diversity and a broad range of experiences even within our groups. I certainly didn’t have any books growing up that portrayed biracial kids. I don’t think the term “biracial” even existed! Obviously that is changing, and I’m glad to be able to contribute stories that validate the existence of kids growing up in interracial families or who are conscious of their mixed racial heritage. I’ve often said that being biracial can feel like being a “minority within a minority,” so it can be a lonely experience, but on the other hand, the more I accept myself and my particular experience of being African American, the more I find people who accept me, as well. 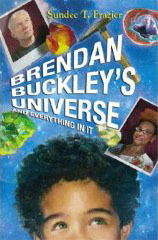 And the fact that Brendan Buckley’s Universe was chosen for the John Steptoe award tells me there’s a growing acceptance of our diversity as African Americans. That’s encouraging to me. BBS: Often we’re forced to either focus on the race of characters or we tell ourselves, race shouldn’t matter to a story. But why do you think it’s important that there be portrayals of mixed race characters? Sundee: Race has been a significant shaping factor in my life, so it’s going to play a role in the stories I tell. There’s just no way around that, and I don’t want to get around it because I believe it’s a big part of what will become my unique contribution to the field of children’s literature. I want mixed race kids to know they’re not alone in their experience, and I want to expose other kids to the reality of interracial families. I also think that what I’ve experienced as a biracial African American is not that different from what many people experience, regardless of race. We all have questions about where we fit, whether we belong, if we’re okay the way we are – adolescents, especially – and these are the kinds of questions my characters are usually asking. Brendan Buckley knows he’s okay, but his grandfather’s views and past rejection confront him with the reality that not everyone will always think so and propel him forward in his evolving view of himself. BBS: What’s next for you after Brendan Buckley? Sundee: Brendan Buckley was sold to Delacorte as a part of a two-book deal. The second book is in process. It’s not a sequel or companion book to Brendan, although I’ve had several requests for one! I’m working on another middle grade novel – this one about twin biracial girls, one black-appearing, the other white-appearing, who go to stay with their Southern black grandmother when their parents’ marriage falters. The grandmother enters them in a pageant for black pre-teen girls. I’m very interested to see what happens! Nicely said, and congrats again for your success both on and off the page! Loved hearing your thoughts, and as the mom of biracial (actually tricracial) kids, I couldn’t agree more with your points on the need for such stories. Much congrats Sundee — and keep on writing! Wow, this interview was great and the book is wonderful! It would have been so wonderful to have had something like this when I was growing up during the ’60s & 70s. I can share this boon and the upcoming book with my daughter and adult son, so that they can get a feel for what it was like for me. They have the unique experience of having the look of biracial kids and constantly dealing with the, “what are you?” Thank you so much for the books and the interview. Great interview. The ALA awards were announced during our Winter Residency at Vermont College, and we were all ecstatic to hear that Sundee, one of our esteemed graduates, was honored. I don’t know if you’ll see this, but I wanted to let you know how much I appreciate hearing how my book is serving kids. Thanks for sharing Brendan’s story with your students, and for understanding that we all need to see ourselves in books. Your commitment to having your library reflect the reality of our diverse world is a great service to all the students who come through your doors.